This is Part VI of an ongoing series of posts based on the family album of Milton Goldsmith, so generously shared with me by his granddaughter Sue. See Part I, Part II, Part III, Part IV and Part V at the links. Now that we have seen the pages Milton devoted to his maternal and paternal grandparents, we can turn our attention to those devoted to his parents, Abraham Goldsmith and Cecelia Adler. First, there is this page: Although they are not labeled, the paired photographs at the bottom must be Cecelia Adler and Abraham Goldsmith. 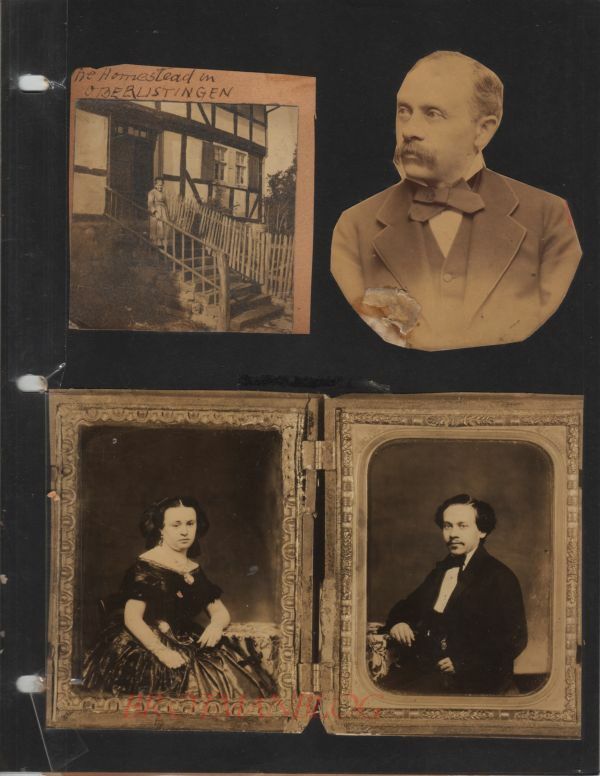 I know this because the photograph on the upper right is one I’ve seen before—I received it from my cousin Julian Reinheimer over a year ago, labeled as Julian’s great-grandfather, Abraham Goldsmith. So I know that the upper photograph is Abraham, and he is certainly the same man as the man in the photograph at the lower right. Could the two framed photographs be their wedding photographs? 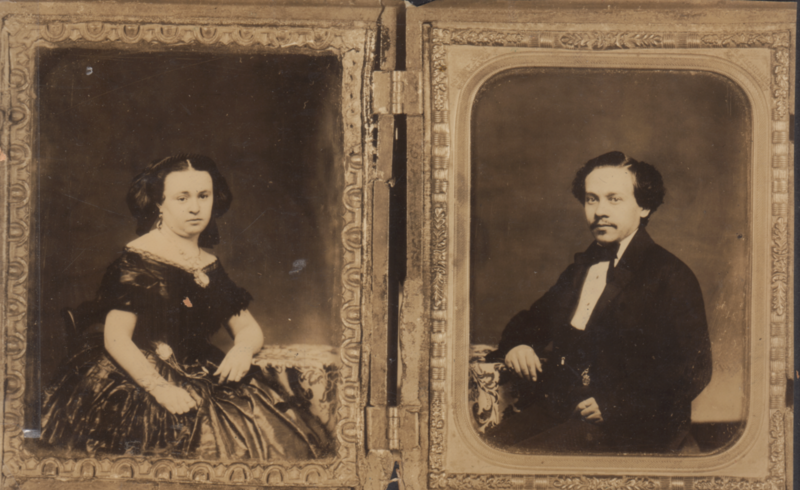 Cecelia was only nineteen in 1858 when they married, Abraham was six years older or twenty-five. Somehow they look older than that in these photographs, but I am terrible at determining age in these old photographs when people dressed so formally and posed so stiffly without smiling. It’s obvious, however, that these two photographs were taken at the same studio and likely at the same time, given that the same table appears in both. I wonder if there was a date on the reverse, but it is not worth trying to remove the photograph from the album to check. 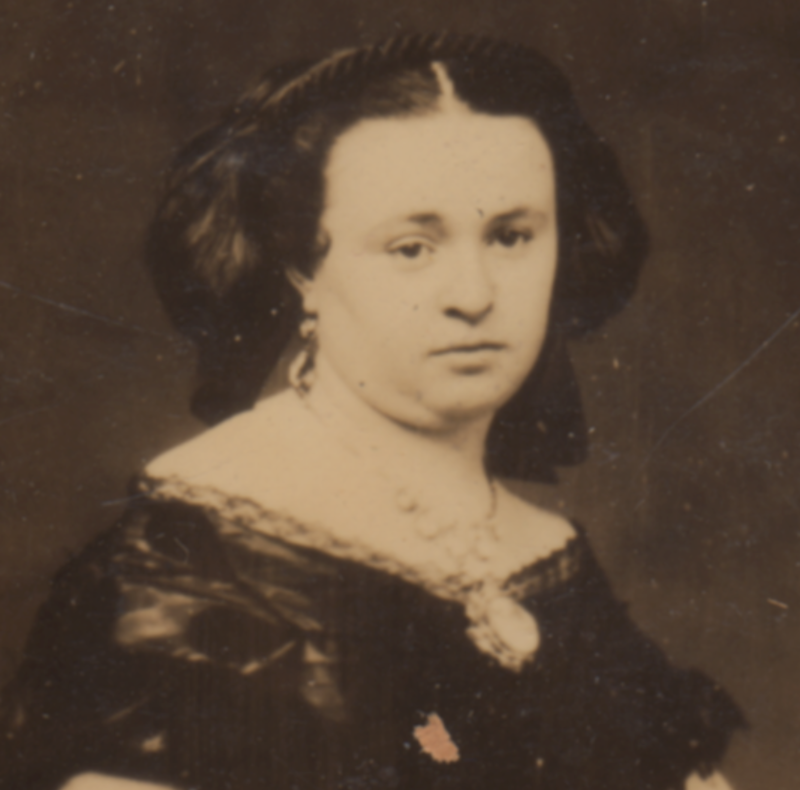 According to Milton, his grandfather Samuel Adler was not successful in business, but Cecelia certainly is dressed very well in this photograph and is wearing what appears to be a large cameo pendant, similar or perhaps the same as the one in the photograph I received from Julian, seen above. Was this taken after she married Abraham, who was in fact very successful in business? Which photograph appears to be earlier? 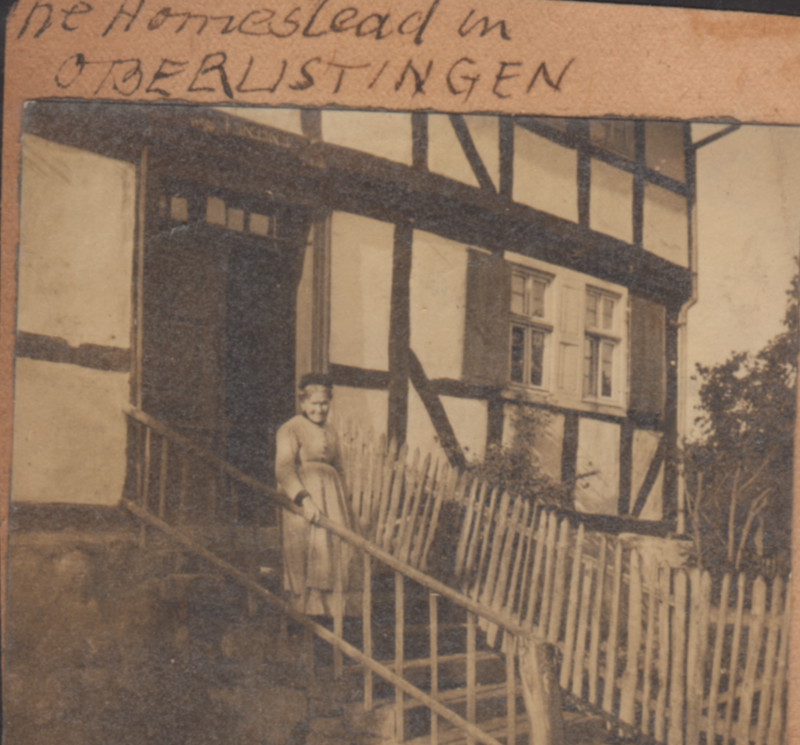 Finally, there is the photograph labeled “The Homestead in Oberlistingen.” This must have been the house where Abraham and his family lived before he and almost all his siblings immigrated to the United States beginning in the 1840s. So who is the woman standing on the stairs in front of the house? 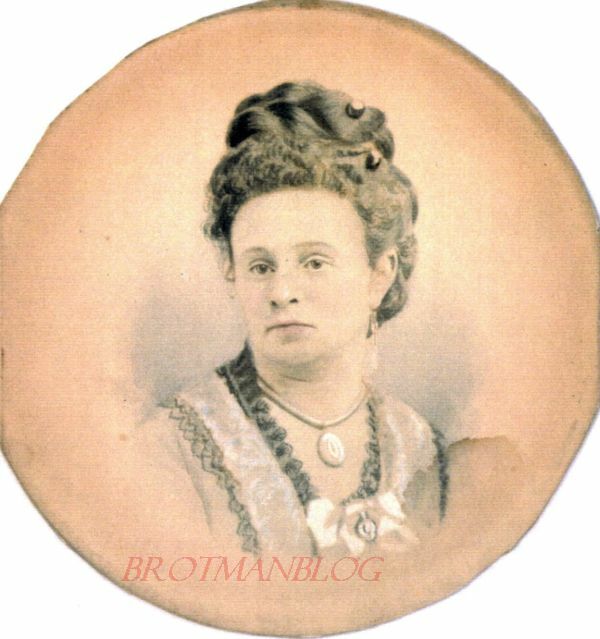 My first hope was that this was Hinka Alexander Goldschmidt, my three-times great-grandmother and Abraham Goldsmith’s mother, Milton’s paternal grandmother. So much to my disappointment, I concluded that this was not Hinka, but some other woman posing on the front steps of what had been the Goldschmidt home in Oberlistingen. Milton did not write much about Hinka, mentioning her only to say that several girls in the family were named for her (including my great-grandmother Hilda Katzenstein Schoenthal, who was the daughter of Eva Goldschmidt Katzenstein and granddaughter of Hinka Alexander Goldschmidt). Milton obviously never met his grandmother Hinka, who never left Germany and died a year before Milton was born. And unlike the heroic war stories passed down about his grandfather Seligmann Goldschmidt, there were likely no such stories shared about his grandmother. 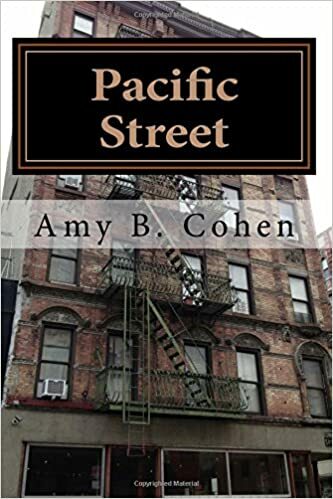 Like women of those times, her life was not in the public sphere, but in the home. So all we know about her is when she was born, who she married, what children were born to her and raised by her, and when she died. 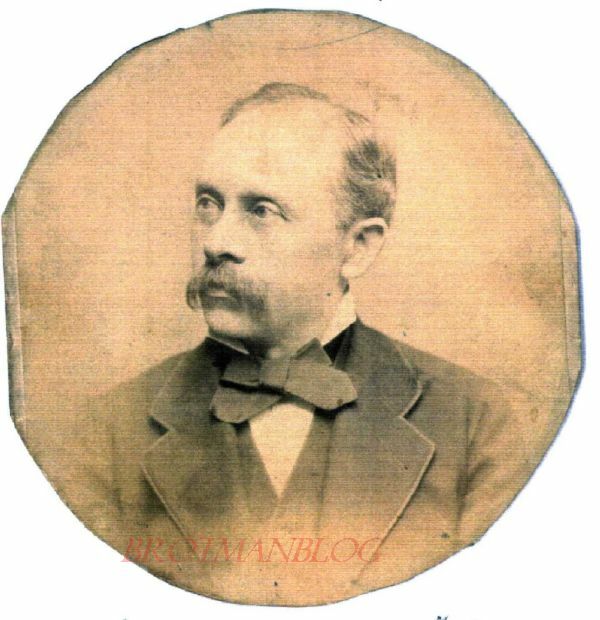 This entry was posted in Genealogy, Goldschmidt/Goldsmith, Milton Goldsmith's Family Album, Philadelphia, Photos and tagged Adler, Germany, Goldschmidt, Goldsmith, Milton Goldsmith, Philadelphia, Photos by Amy. Bookmark the permalink. I agree! Thanks, Leslie–always good to hear from you. Hope all is well. The framed photographs of the couple are fantastic. So nice to see they kept them in the hinged frame. I’m sorry you were disappointed the woman wasn’t Hinka. Actually, I wonder if Sue has the originals in the frame or only these photos of the photos in the album. Hmmmm. The album, from what you’ve shared so far, looks like a scrapbook. It could be they are photos of the originals. Right, that’s what I think. But I wonder if Sue has the actual framed photos. Wow, that would be awesome. would be the younger version of Cecelia, she looks composed on both. I know—people were so mature looking back then! I’d frame the ‘Homestead’ photo! How wonderful! Yes, and now I have to go back to Oberlistingen and find it! These photos, Amy! And that one of the stairs in the front of the house! So do you think that is a photo or drawing/sketch of Hinka? And why? I can’t tell but to me, it seems sort of sketch-like. 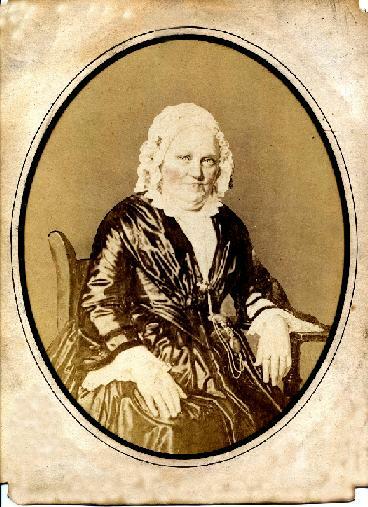 And she died in 1860 so it would have been an early photograph, if it was a photograph. I am not sure since I’ve only seen this scanned version. Here is my 1.5cent worth: that it’s a scan of a copy of a tintype. I’ll buy that. And it could be a scan of a scan of a copy of tintype…. Lovely collection of photos Amy. I can understand your disappointment that the woman outside the house isn’t Hinka. Yes, but it wasn’t very realistic of me to think that it was! I am so behind on my reading 😦 I love Cecilia’s cameo – it reminds me of one my grandmother passed on to me.